When people get to know me, they often ask “When do you sleep?” Through my own choices, I take on a lot of responsibilities. I have a problem saying “No.” I also feel that nobody else can “do it” the way I can, so I can’t delegate some of my responsibilities. I’m not special, or different…many women experience my typical day… starting by making sure my tweenager gets out of bed in time to make the bus (because if she misses it and I have to drive her to school, my day is COMPLETELY thrown off!). Then I MUST get my morning Starbucks (shout out to the crew on Five Points Road who keep me fueled!). Depending on my schedule, I either head to the office or to a meeting. Getting in at 7:30 makes a HUGE difference in my productivity! Emails get answered, phone calls returned, estimating gets done, organizing gets done (although my desk may not look like it!). As the day wears on, all those things in my “To Do Today” pile get redistributed to the “Can Do Tomorrow” pile because I inevitably get pulled into a conversation, or need to solve a problem. I’ve been “mom” already, I’ve been “business owner” already, now it’s time to be “wife.” Hard to separate sometimes because my husband and I run the business together. Yes, I know I’m crazy! We just celebrated our 17th wedding anniversary and still have something to talk about besides work. Thankfully, we have Jen (my lifesaver and graphic designer) to keep us on top of our P’s and Q’s in the office. Juggling is so much easier when someone is there to catch the bones that fall. 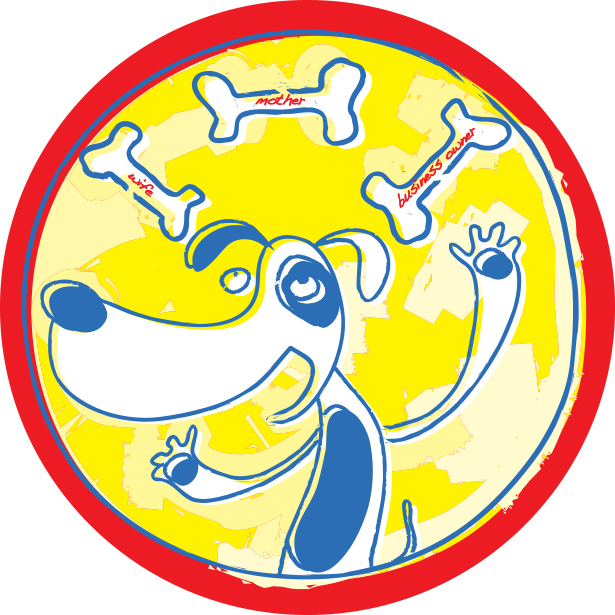 Let Blue Dog Printing & Design catch your marketing bone. I’m not happy unless I’m busy. Give me a bark! 610-430-7992 or email debi@getbluedog.com.